My lame photoshopped email notice. 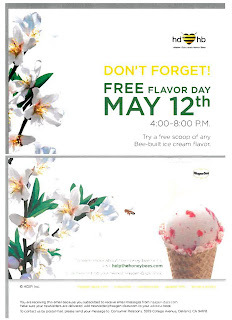 Go to Haagen-Dazs at 1286 Broadway south of 34th and get a free scoop of any Bee-built ice-cream flavor. Also, go Haagen-Dazs' Help the Honey Bees site and help save a bee. I visit just to "explore the fields," which is a really cute and slightly addictive function. And next week, the White Hot Sale, involving 30% off regularly priced merchandise, from 5/21-5/25. I know you Banana lovers are way into that! "White hot" and "Liz Phair" reminds me of dialing my ex really late at night and playing Liz Phair really, REALLY loud on his answering machine. Ah, youth! But go to Banana and support Liz, kids, because she's been there for the girls in the past. Nothing drives a guy crazier than having a, ahem, "pissed" off ex force him to listen to Liz Phair. And speaking of guys, the Joseph Abboud sale at Soiffer-Haskin is now offering a free dress shirt and tie with purchase of any sport coat, while supplies last. Be sure to check out the link for details. If you're not looking for your man, save Soiffer for the Cole Haan sale on the 17th - 21st. Last is the swim sale at Old Navy. Adult swimwear starts at $12.50 and kids at $8. I have to say, Old Navy swimwear is great for the price. I have tried it on and not been disappointed with the fit. i can't wait to be in new york! thanks for the tips! I'm so ready to hear the rest about the ex and Liz Phair. Alison - you have a trip planned? yay! SW - oh, this is a LONG one, must be done over drinks (so after October). Damn these opposite coasts. ahhh! i missed the ice cream! ?